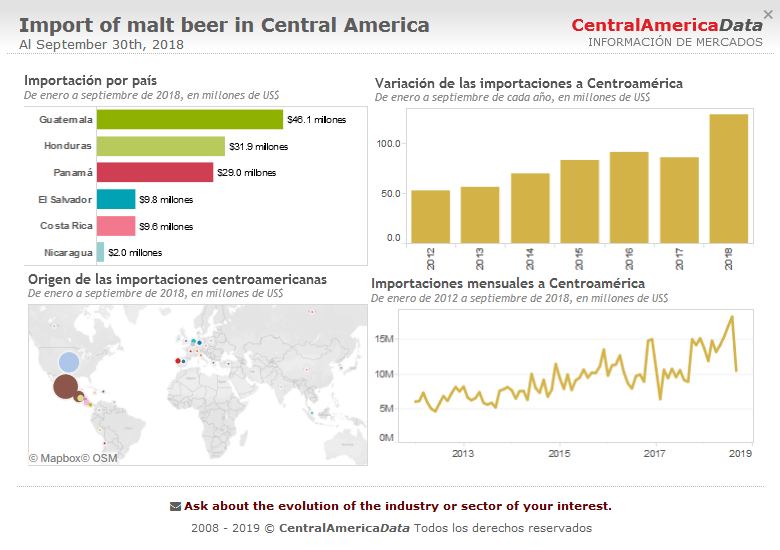 From January to March of 2018 Central American countries bought $40 million worth of malt beer from abroad, 46% more than the same period in 2017. 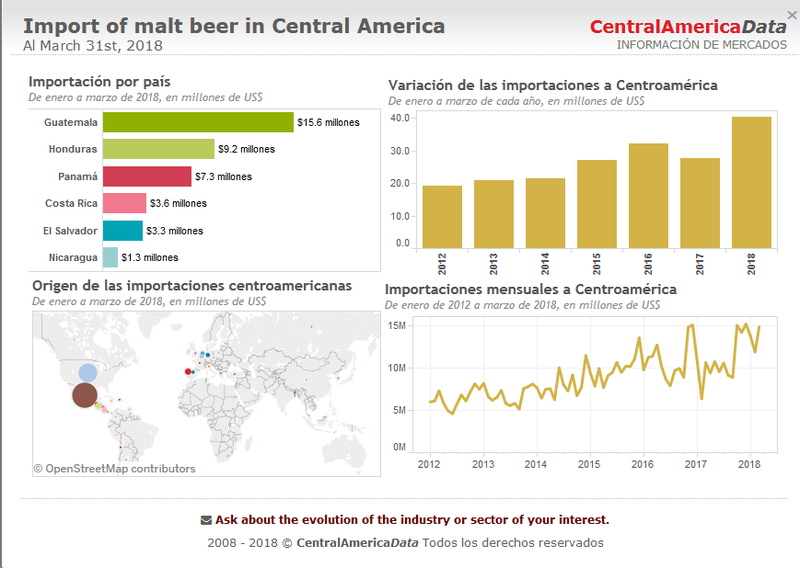 In the first three months of this year, the main importer of beer in Central America was Guatemala, with $16 million, followed by Honduras, with $9 million, Panama, with $7 million, Costa Rica, with $4 million, El Salvador, with $3 million and Nicaragua, with $1.3 million. For the period from January to March of 2017 and 2018, the value of imported beer in Central America increased by 46%, rising from $28 million in 2017 to $40 million in 2018. In the first three months of the years between 2013 and 2016, regional purchases abroad grew steadily at an annual average of 14%. Regarding the monthly import value, the graph shows a clear upward trend for the months between January 2012 and March 2018. From January to March 2018, 53% of the value purchased by Central America came from Mexico, 29% from the US, 3% from Portugal and 2% from Belgium. Mexico is the origin market for imports that has grown the most in the quarter in question in the last seven years, as in 2012 it represented 30% of total purchases and in 2018 that figure rose to 53%. In the first nine months of 2018, beer imports in Central America totaled $128 million, 50% more than in the same period in 2017, and the increase is because of the behavior of purchases from Mexico. In the first nine months of this year, the main importer of beer in Central America remained Guatemala, with $46 million, followed by Honduras, with $32 million, Panama, with $29 million, El Salvador and Costa Rica, with $10 million each, and Nicaragua, with $2 million. During the period from January to September 2017 and 2018, the value of beer imported into Central America increased 50%, from $85 million in 2017 to $128 million in 2018. For the periods concerned, regional purchases from Mexico increased 48%, from $39 million to $58 million. From January to September 2018, 45% of the value purchased by Central America was from Mexico, 31% from the U.S., 2% from Portugal and 2% from Belgium. Mexico is the market origin of imports that has grown the most in the months concerned in the last seven years, since in 2012 represented 31% of total purchases and in 2018 grew to 45%. For brewers in Panama it is necessary to incorporate innovations in manufacturing, since in the local market consumption has ceased to be a fashion to become a trend. The expectations of Panamanian businessmen are encouraging, because they expect that the demand for high quality artisanal beer in the country will continue to increase, so continuous improvement of the product will be key to the expansion of production. See "Beer Imports Up to September 2018"
Alejandro Quiodettis of Cervecería Maestra, explained to Martesfinanciero.com that "... The growth of artisanal beer brewing in Panama has gone from being a fashion to a trend, reason for which it is key to see first hand what the great American players do, so that the local company also conforms to innovations. Each one of us is looking for ways to improve each time, and we are aiming at that goal, to look for the best ingredients to prepare under high quality standards the handcrafted beer." Ricardo Richo Fernández, from Cervecería Casa Brujas, said that "... What has happened in Panama with the movement of artisanal beer has caused not only a great boom in this segment, but has also benefited the traditional industry. The key is that we are making a great quality artisanal product that will continue to grow." You may be interested in "Wines: Imports up to the first half 2018"
According to reports from CentralAmericaData, in the first nine months of 2018 the main importer of beer in Central America remained Guatemala, with $46 million, followed by Honduras, with $32 million, Panama, with $29 million, El Salvador and Costa Rica, with $10 million each, and Nicaragua, with $2 million. When you want a cold beer and cool atmosphere, these are plenty of places to go in Panama! At these spots, you can find local craft beers like Casa Bruja, original house-brewed beers, international IPAs, and of course the classics: Cerveza Panama, Atlas, and Balboa. Panama Brews is a hidden gem in Panama City and the first to feature over 35 LOCAL craft beers ON TAP! You can order a sample shot flight for $3 to try six different brews and then order a pint of your favorite. The bar is even equipped with a chiller to keep your beer cold while you drink! It’s a little hard to find, but it’s on the second floor of Balboa Boutiques towards the back. El Republicano is a gastropub located in the Coco del Mar neighborhood in Panama City. They feature a few of their house-brewed beers as well as several other local craft beer favorites. A small bar located on Via Argentina has some fantastic house brews. They also serve complimentary popcorn! Independiente just opened in 12 de Octubre and has a large selection of Panamanian craft beers. You can order a taster for $5 that includes four local beers on tap. Biergarten has a huge selection of international craft beers as well as a few local brews on tap to try. It’s located in the pool area of the Granada Urban Hotel and an excellent spot to enjoy a drink outdoors! Istmo is a great spot to hangout with friends! You can try one of their original house-brewed beers, play a game of pool, or listen to live music. They have locations in San Francisco and El Cangrejo. Lynchburg serves authentic German food with a wide selection of specialty beers! They also have live music a few nights a week. La Rana Dorada is a favorite spot to go for their local house-brewed beers. Be sure to get the boat sampler before you order so you can try them all! They have locations in Casco Viejo, Via Argentina, Costa del Este, and San Francisco. You can also stop by their actual brewery in Loceria on Friday from 4 pm to 8 pm and Saturday from 12 pm – 6 pm. Put “Cerveceria La Rana Dorada” into Waze or Uber, and it will get you there. Brew stop has knowledgable staff that loves beer with an awesome selection of craft and IPA beers like Rogue, Lost Coast, Abita, and more! They have locations in Marbella and El Cangrejo. LB Bieren has one of the largest selection of specialty beers, and they are a retail store that lets you drink the beers you purchase at one of their small tables or take them to go. Located in San Francisco. Feel like you’re drinking at home at El Apartamento! Chill atmosphere to go with friends for a few drinks. Located on Federico Boyd. Another great restaurant serving authentic German food and international beers in a cozy atmosphere. Located in Coco del Mar. Chill and casual spot to go in Casco Viejo for some well-priced beers. I saved the best for last… Casa Bruja is my favorite locally brewed beer in Panama, and they have recently opened a small taproom at their brewery in Costa del Este. It’s only open Wednesday, Thursday & Friday from 5 pm – 9 pm and Saturday morning for tours so be sure to stop by for the best beers on tap! They also have a location opening July 2017 in Casco Viejo.